Puerto Rico needs more entrepreneurs. What's being done to help them? “Even though we have improved many things, there are still a lot of barriers stopping those who wish to become entrepreneurs,” said a business expert. In an island thirsting for a sustainable economic future, Hurricane Maria made visible Puerto Rico’s untapped entrepreneurial potential. For Puerto Rico-based entrepreneurs, whether they were locals or recent transplants who had set up shop in the island, the worst storm in a century proved to be the ultimate test in keeping and growing a business despite unimaginable setbacks. Yet the U.S. territory has to prioritize how to facilitate and promote business creation, especially for those who lack funding and resources, according to analysts. “Even though we have improved many things, there are still a lot of barriers stopping those who wish to become entrepreneurs,” said Javier Hernandez, director of the School of Business Administration at Universidad del Sagrado Corazón in Puerto Rico. Though four in 10 Puerto Ricans reported losing their jobs during the storm’s aftermath, most small businesses —which are one of the island's main sources of job creation — survived post-hurricane. Roughly 36,000 out of Puerto Rico's nearly 44,000 small employers were able to resume operations over the last year. According to a survey from the New York Federal Reserve Bank, the entrepreneurial energy among surviving firms in Puerto Rico increased over the same time period — even though many faced significant hurricane-related financial impacts such as decreased revenues, increased expenses and indebtedness. Business confidence also soared in the year following the storm with most surviving firms saying they expect to remain in business. One of these surviving firms is Cleancult, an island-based small manufacturer of “green” non-toxic laundry and cleaning products. Ryan Lubperger, 23, left California and relocated to Puerto Rico shortly after founding the company in 2016. Lubperger found he could reduce manufacturing costs and other expenses by producing in Puerto Rico. Four months before the hurricane hit, Cleancult had produced about 10,000 units and the company was planning on rolling out products into 200 stores in Puerto Rico by December. Then the storm upended those plans. Instead, a new set of challenges were heaped on Lubperger. From lacking WiFi services to be able to fulfill online orders to not having electricity to function and depending on generator power, Cleancult had to temporarily move its manufacturing to New York. Amid the challenges, the goal that initially brought Lubperger to the island is still present in his entrepreneurial plans. “It never crossed my mind to leave. Now my family is here [on the island], our employees are here,” Lubperger told NBC News, adding that the hurricane gave him a sense of responsibility to the island. “I feel more committed to staying here." Cleancult donated 100,000 loads of laundry to the Light and Hope for Puerto Rico campaign and helped them raise $60,000 for hurricane relief efforts. Fifteen months after the disaster, Cleancult has still not resumed manufacturing in Puerto Rico, but the company has many plans for 2019 — from moving into new laboratory facilities in Mayaguez, Puerto Rico to investing $1.7 million in research and development in the next two years as well as hiring new employees. The Puerto Rican government-backed economic development and accelerator program known as Parallel 18 has been recruiting entrepreneurs like Lubperger for three years. Parallel 18 was created in 2015 to attract young entrepreneurs to the island in the wake of Puerto Rico’s financial crisis, when the island racked up a $72 billion public debt. The program offers funding, mentoring, consulting and introduction to investors in exchange for living and operating their business in Puerto Rico, as well as working with students at local universities. The program has successfully attracted hundreds of entrepreneurs and participating companies have generated $14 million in sales — more than half of that on the island. Yet the program only serves one small part of the entrepreneurial population in the island. Hernandez explained that one of the toughest stages entrepreneurs face is turning their idea for a new company or product into a business and making their first sale. “That requires seed funding, a chance to test the product in the market… Many, many things have to happen before that first sale,” he said. Puerto Rico’s gubernatorial policies to support entrepreneurship in the island were ranked as not sufficient by most experts surveyed in the latest Global Entrepreneurship Monitor (GEM) report. Hernandez sees a lack of effective support mechanisms and mentoring programs to specifically help entrepreneurs at the initial stages. He also sees a need to ease the process of starting a new business — from getting the pertinent permits to complying with the different levels of government — as well as more collaboration and exchanges between government officials and entrepreneurs, whether they be small freelancers or multinationals. The Puerto Rican government hosted a private-public partnership summit a couple of months ago, showcasing business opportunities on the island. Officials touted the island’s already-existing business programs and tax incentives such as low corporate taxes and significant tax exemptions for individual investors. Despite the tough economic situation, the GEM report found that prior to the hurricane, there had been in a rise in the number of Puerto Ricans who felt they could start a business on the island. However, there’s a gap between those entrepreneurs who attempt to start a business versus those who actually open one. Experts cite inefficiencies in the way the Puerto Rican government taxes and regulates businesses, arguing it's not proportional to the size of the companies and does not promote new small and medium enterprises. Nancy Santiago Negrón, vice president of strategic partnerships and communications at Hispanics in Philanthropy and a Parallel 18 advisory board member, thinks the local and federal government can do more to support and fund the island’s startup ecosystem and fuel economic growth at a critical time. “When we can’t change legislation, we can change policy by partnering with the right folks,” she said at a Parallel 18 panel in New York City last month. “But to do that, we have to know that the leverage comes from Washington D.C. and we have to be willing to have the conversation there,” said Santiago Negrón, a former senior staffer within the Obama administration. In order to incentivize banks to invest in the island and help inject much-needed cash flow into Puerto Rico, the federal government entities that regulate the Community Reinvestment Act (CRA) — which encourages financial institutions to lend money to people who live or work in low or moderate income communities in their area — to extend the implementation of the law so it could apply to Puerto Rico, which was deemed a disaster area after Hurricane Maria. “The CRA declaration allows any financial institution located in any state of the United States to invest in the development of the most affected communities in Puerto Rico,” said Gerardo Portela, chief investment officer in Puerto Rico, in a statement. Since banks benefit from having a good CRA record — it improves financial institutions’ chances when they apply for bank mergers or branch openings, for example — the hope is that banks will make more money available for Puerto Rican entrepreneurs and businesses. For many Puerto Ricans, entrepreneurship became a lifeline after the hurricane, when jobs were lost and circumstances were turbulent. Parallel 18 made an effort to support small, local entrepreneurs — many of them young — who came up with ideas inspired by hurricane hardships through a newly-created pre-acceleration program called Pre18. Three hundred and seven companies applied to Pre18. Forty were accepted and completed the program, including an agro-entrepreneurial company, Cosechas Tierra Viva, that came up with a sustainable, innovative solution to the food shortage crisis that unraveled in Puerto Rico during the hurricane’s aftermath. The Pre18 companies hired 139 employees in Puerto Rico and surpassed half a million dollars in revenues. The key is to have policies that help these companies scale up and achieve long-term growth — and keep young entrepreneurs from leaving the island. ”Puerto Rico can match any place in the world in ideas… but not [yet] in turning them into a company or a product or exportable idea,” Miguel Ferrer, entrepreneur and co-founder of Peloton X, LLC, a business strategy firm, told NBC News.“The future looks promising, but it doesn’t mean it’s going to be easy." Puerto Rico is expecting the disbursement of approved federal funding from the U.S. Department of Housing and Urban Development (HUD) in upcoming months, and some of the money is expected to help Puerto Rican businesses move forward. 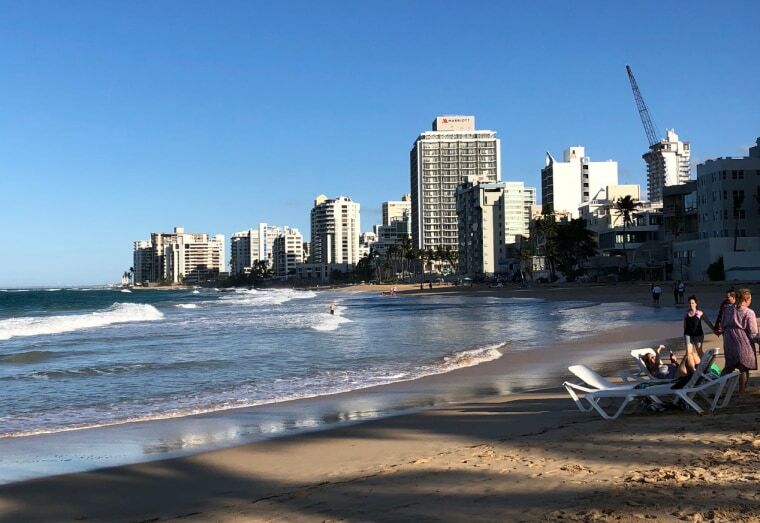 In the meantime, entrepreneurs like Lubperger and fellow Parallel 18 alum Lauren Cascio are trying to maximize the economic opportunities they've gotten in Puerto Rico and contribute their bit to help the island financially. “We hope that we can be part of the positive in Puerto Rico, hire and retain talent in Puerto Rico,” said Cascio, founder of Abartys Health, a health technology company that helps insurance companies manage and streamline their data online.